Comedy's grossest and worst-kept secret is finally out. 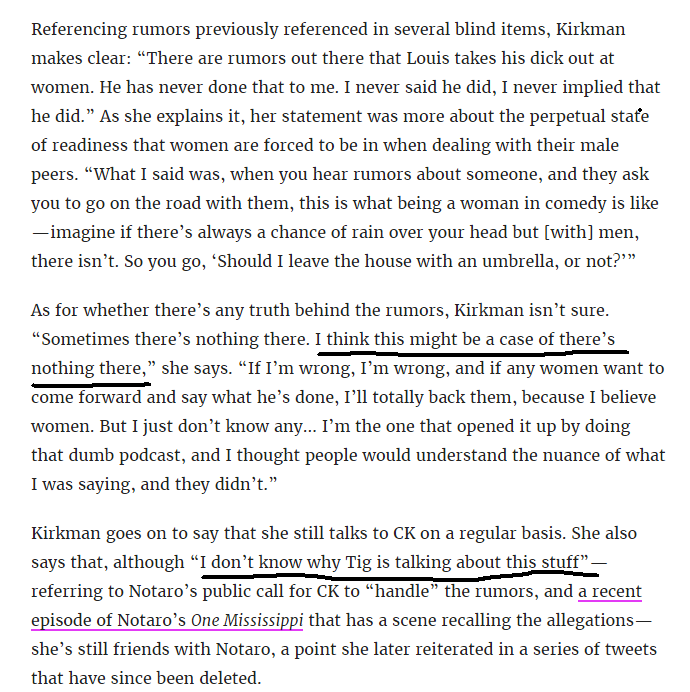 The New York Times reports that after many years of rumors, multiple women on the comedy circuit have gone on the record saying Louis C.K. masturbated in front of them without their consent. (The story is extremely graphic, but I think it ought to be to really convey what these people endured.) After being contacted by the Times about the on-the-record accusations of sexual misconduct -- encounters that took place over a decade ago -- Louis C.K. 's publicist, Lewis Kay, said the comedian would not respond -- something peer Tig Notaro had implored him to do before it came to this. Comedian Jen Kirkman, who was one of the first brave people to shine a light on the lurid rumors, raised eyebrows when she later deleted a pocast on which she discussed them on the grounds that we were all too stupid to get her "nuances." (A powerful man intimidating women into keeping quiet seems pretty black and white to me, but OK.) She was recently quoted as saying she thinks the situation "might be a case of there's nothing there" and that she didn't know why Tig Notaro was "talking about this stuff." (Um, maybe because women said they'd been violated and no one had been held accountable.) 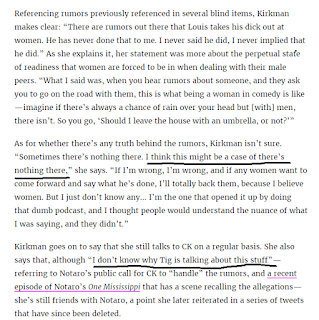 Kirkman's doing this -- essentially casting a doubt -- was the first time it ever entered my mind that maybe Louis C.K. wasn't the perpetrator (way to go, Jen). Thank god people DID continue to talk about "this stuff." We've come a long way in a very short time. 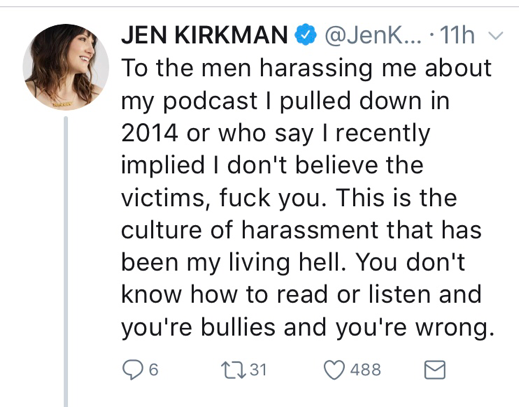 Yes, she’s the real victim here.